Family run Lake District based cruise company Ullswater Steamers beat off stiff competition from global giants, including the likes of TUI Cruises and DFDS Seaways, to claim an internationally prestigious World Responsible Tourism Award. 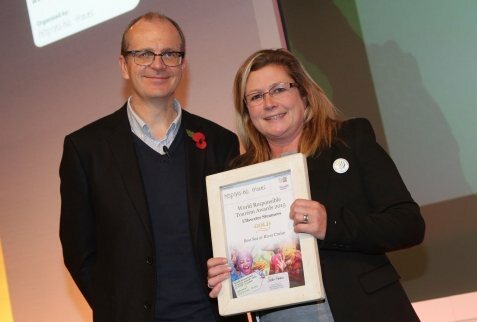 Rachel Bell, Steamers Marketing Manager, attending annual global travel industry event World Travel Market, held at London’s ExCeL, was presented with a gold award in the ‘Best Sea or River Cruise’ category, on World Responsible Tourism Day, Wednesday 04 November. The World Responsible Tourism Awards now in their 12th year, are organised by founders Responsible Travel, in association with the International Centre for Responsible Tourism and celebrate the most inspiring stories in responsible tourism from around the globe.